Fir has been mentioning to me of late that Dr. Martens boots are really common in Singapore nowadays. And I see where she's coming from. At least 1 out of 5 people I spot in Orchard are sporting Dr. Martens. I guess its not such a bad thing since Singaporeans are moving beyond flip flops and exploring other footwear options, but recently I discovered George Esquivel's hiking boots, and they look like they could give Dr. Martens boots a serious run for their money. What I love best about these boots are how they reflect Esquivel's aesthetic - combining a classic accessory with a statement piece, mixing modern and vintage and most importantly, putting the masculine and feminine together. The result is a lust-worthy unisex design that can sit proudly on the shoe rack of any boy or girl. 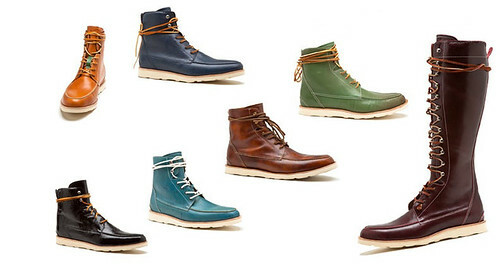 The colors that these boots come in are gorgeous as well, reminding me of the great outdoors. Think sage green, rust, cognac, shiny black and teal. Now can someone tell me where I can get my hands on these pair of boots in Singapore?